Remember that 15.36TB SSD Samsung launched a year ago? You can now buy it, for just $9,690 (about £7,400 or AU$13,000), from a couple of US retailers. At £480 (about $630, AU$840) per TB, that's actually not far off the selling price of Samsung's next biggest SSD, the Samsung 850 EVO 4TB model, which works out at about £325 (about $430, AU$570) per TB in the UK. The 15.36TB SSD is not only more capacious than the largest hard disk drive (models from Seagate and WD currently top 10TB), but also far smaller (2.5-inch compared to 3.5-inch). 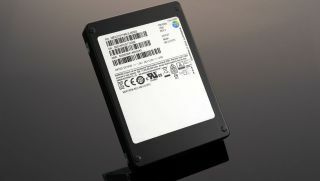 That means Samsung could easily produce a 30TB HDD-sized SSD giant if it wanted to. The SSD, known as the PM1633a or the MZILS15THMLS, uses 48-layer, 256Gbit chips to deliver random read/write speeds of 200K and 32K IOPS respectively as well as sequential read/write speeds of up to 1.2Gbps over SAS interface. Back in August 2015 Samsung demonstrated a 768TB storage setup that included 48 of these drives. The server managed to reach a staggering two million IOPS, making it ideal for OLTP (Online Transaction and Processing) solutions. The question remains though: Can it run Crysis?